Well, it's the time of the year again! for their kiddy's favorite cartoon character's special appearance. City Square Mall is housing those adorable Pokémons. they will also be educated about the importance of energy efficiency. killing 2 "pokémons" with 1 stone?!?!?!? To take a picture with the Pokémon characters, shoppers can redeem a photo-taking pass with $30 spent in a maximum of 3 combined same-day receipts at the Customer Service Counter on Level 2 one hour before each show. In this season of giving, City Square Mall will be handing out complimentary Pikachu headbands to the first 2,000 children present for the show, while stocks last. Children between the ages of 3 to 12 years old will learn how to make a Pokémon pen holder using recycled materials at City Square Mall’s signature eco-workshops promoting the 3Rs – Reduce, Re-use and Recycle. Participants will challenge Pokémon Trainers to a game of Pokémon with their Nintendo DS. The participants will start with the first level and progress to the next level upon winning a game. Winners of all four levels will be invited to participate in the Pokémon NDS Winners Cup Tournament while those who have lost the game may re-challenge the Pokémon Trainers. Participants who have cleared all four levels of the Pokémon Nintendo DS Challenge will be invited to take part in this tournament using their own Nintendo DS. They will be matched up against each other and play in several Swiss Matches. Top 3 winners will each walk away with a Nintendo 3DS Pokémon Rumble Blast Video Game. For the first prize winner, there will be a Winners Cup Trophy presented while the second and third prize winners will each receive a medal respectively. Pokémon Professors will be on hand to teach new players who wish to learn how to play the Pokémon Trading Card Game, as well as guide beginners who want to improve their playing skill. Participants who have pre-registered on the City Square Mall website will compete with players within their respective age divisions – Junior, Senior and Masters – in several Swiss Matches. Players should use their own cards during the championship and the undefeated player in each age division stands to win an 18 x Pokémon TCG Booster Pack and the Pokémon City Championship Winner’s Medal. Meet and take a picture with Santa Claus and City Square Mall’s eco-fairies to capture that magical moment. 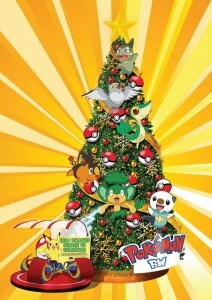 Have an Awesome Pokémon Electrifying Christmas at City Square Mall! if I don't get to see you to say this personally. Have a Merry Christmas and a Great New Year Ahead!